1. Apply for what you need: We need to know the types of plants and the quantities needed, on a timely basis in order for us to focus on meeting your demand. Some plants take a few months while others take up to a year before we can produce a saleable plant. If you don’t provide us with the information on time you would find that we would not be able to satisfy your demand. We usually advise persons to send in applications before the September 15 deadline when we would be preparing our targets and budget estimates 2. Apply for what can be planted in the available land space: If you inflate your request too high you would also find that we would be producing large quantities of plants that no one wants to buy. We cannot waste the limited resource that you the tax payers have provided to us. 3. Apply for plants that are best suited to your area: Some plants require open sunlight, some require a bit of shade, others need windbreaks while some could tolerate strong winds. the supply of water for periods in the dry season when water from our dam is diverted by NAWASA to increase the domestic supply for residents in St. Andrews. We have limited resources: Our stations do not have adequate sources of planting material since most of our germplasm were damaged during the hurricanes. We also have high demand for plants like soursop and nutmeg for which we have to rely on kind farmers and the GCNA to continue providing us with seeds and other planting material. Untimely supply of inputs resulted in decline in the quality of our products. Like the rest of the world, we are undergoing budgetary cuts resulting in us really tightening our belts. This situation has improved a bit so we look forward to some improvement in the months ahead. One of our main problems in that the number of skilled propagators has been steadily decreasing and due to financial constraints replacements are not forthcoming. mation will be used by the Farming community as a guide to help them in crop selection and planting times. 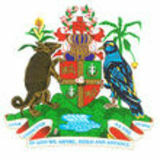 The newsletter is published by the Ministry of Agriculture, through the Land Use Division. Your feedback is highly appreciated and will help us to improve this newsletter! 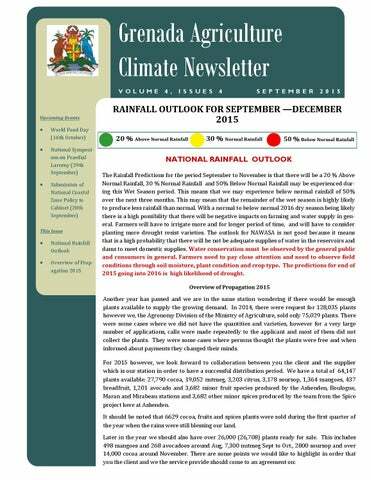 This newsletter is supported by the “Integrated Climate Change Adaptation Strategies” (ICCAS) project, which is funded by the German Federal Ministry for the Environment, Nature Conservation, Building and Nuclear Safety (BMUB) and jointly implemented by the Environment Division of the Ministry of Agriculture, Lands, Forestry, Fisheries and the Environment, the German Agency for International Cooperation (GIZ) and the UNDP.